Although Northern Thailand suffers from a dreadful lack of islands — it’s landlocked and mountainous — the region still tops the list of favorites for where to go in Thailand. Many of the best places to visit in Northern Thailand share an outwardly positive vibe. It’s just... different, in a good way. Culture inspired by Lanna, Shan, Karen, and other indigenous ethnic groups in the region provides a noticeably friendlier atmosphere than that often found in the south. The Golden Triangle, where Thailand, Myanmar, and Laos meet, doesn’t just produce opium anymore. Thanks to the slightly cooler climate, you can enjoy some indulgences in Northern Thailand that are sometimes difficult to locate elsewhere in the country: real coffee, tea plantations, vineyards, and strawberries. Even the festivals are bigger in the north. Loi Krathong/Yi Peng (the one with sky lanterns and candlelit boats) and Songkran (the Thai New Year water fight celebration) are celebrated with more gusto than anywhere else in Thailand. Note: Although Isan — Thailand’s largest region — occupies 20 sizable provinces that border Laos and Cambodia, it is traditionally considered “Northeastern Thailand” rather than “Northern Thailand” because of cultural differences. Any discussion of interesting places to visit in Northern Thailand has to begin with the northern capital of Chiang Mai. Most destinations are within an easy striking distance of the city. Chiang Mai (pronounced: “ch-ae-ng mye”) means “New City” in the Lanna language. Despite the prevalence of elephants in the local culture, the name has nothing to do with chang (elephant), properly pronounced “ch-ah-ng” in the Thai language. Why the New City? Chiang Mai took over Chiang Rai’s job as capital in 1296. To bust another popular myth, Chiang Mai is not the second largest city in Thailand as many travelers think — but it does somehow serve as a cultural heart for the country. The city offers the classic winning trifecta that attracts travelers: friendly locals, great food, and affordable prices. With the usual amount of frugality, you get more bang for the travel buck in Chiang Mai — and Northern Thailand in general — than in Bangkok or the islands. Chiang Mai’s Old City is a perfect square with all the defenses necessary to survive as capital in the 14th century. Elephant-proof moat, giant gates, a defensive wall with brick ramparts — they’re still standing. The labyrinth of confusing streets and passages in the interior of the Old City hides plenty of enjoyable finds — including a high density of temples. But the action isn’t all contained within the moat. Some of Chiang Mai’s most interesting places lie outside of the Old City, just within scooter range. If you don’t mind crowds, the weekend markets are a fun spectacle of socializing, nibbling, and shopping that attract just as many locals as tourists. The markets are definitely a good option for sampling local treats and grabbing inexpensive souvenirs — but you’ll still need to negotiate. Although Bangkok may offer 100 times the choices, Chiang Mai just feels more manageable. Things are easier to find. Want to help a good cause by getting a massage from a blind man or an incarcerated woman? Easy! And unlike in Bangkok, you can probably walk there in minutes; no public transportation necessary. Fun fact: Notice a high density of MacBook Air laptops in the many cafes? That’s because Chiang Mai is home to a large community of location-independent entrepreneurs and expats who call themselves “digital nomads.” They share cafes and coworking spaces alongside online English teachers, bloggers, and others who earn a living with a laptop. Even when dial-up modems were screeching for connections and online work wasn’t possible, Chiang Mai held appeal for artists, writers, and long-term travelers who were interested in dropping anchor for a while. Ahhh, Pai. The elephant-pants-wearing, man-bunned, tattooed-traveler capital of Thailand. Despite Chiang Mai’s many draws, sometimes the sizable rats and endless traffic circling the moat can become too much. Thankfully, there’s Pai. A bit less than four hours north of Chiang Mai, Pai is a much smaller, chilled-out, riverside option for getting away from concrete. Although still mostly green, Pai’s popularity and its development have grown tremendously in the last decade. So far, the charm has survived. Travelers of all budgets and nationalities cram into minivans to visit Pai. A surprising number come and decide not to leave. But don’t let outdated guidebooks that still refer to Pai as a “quiet, hippie town” fool you. The growth in tourism sent many of the original “hippies” scurrying out of Pai to quieter destinations or homesteads in the hills outside of town. Somehow, despite the size, the backpacker-oriented nightlife rages later than Chiang Mai’s. Fortunately, there are plenty of organic eateries, juice shops, and healthy options for curing next-day regrets. Visiting tip: Pai’s legacy as a healthy place grows. You’ll find a high concentration of vegetarian and organic food (much of which is grown nearby), juice shops, and options for a healthier lifestyle. Yoga retreats, tai chi, qi gong, meditation centers, holistic healing workshops — Pai offers a lot of opportunities for improving health and knowledge if you can avoid the reggae bars. The city of Chiang Rai is an anomaly among the places to go to in Northern Thailand. With a population of only around 75,000 people, it’s certainly smaller than Chiang Mai. But the city is buzzing with commerce, universities, and daily life — which unfortunately includes plenty of traffic. Most tourists are drawn for a short visit to Chiang Rai thanks in large part to the impressive creations of Thawan Duchanee and Chalermchai Kositpipat, two renowned Thai artists. After enjoying their contributions to the city, you can escape to the serene Khun Korn Forest Park, a worthwhile 45 minutes away, to cool down under a waterfall. Until his death in 2014, Thawan actually lived in his otherworldly masterpiece — an estate known as Baan Dam (the Black House). Meant to be a portrayal of hell, the creepy grounds and buildings of the Black House are adorned with animal bones and demonic art. Exploring definitely bestows a dark sense of wonder. On the other end of that spectrum, Chalermchai Kositpipat’s bizarre work Wat Rong Khun (the White Temple) is a visually stunning Buddhist temple that somehow integrates religious themes with Hollywood and Hello Kitty. The Matrix, Terminator, and Superman — along with many other works of fiction — receive shout-outs in the mesmerizing murals. The White Temple will cheer you up a bit after having explored the Black House; that is if you don’t pay too much attention to the rejected souls writhing in agony before the gates of heaven. Another famous work from Chalermchai is Chiang Rai’s golden clock tower set prominently in a roundabout in the center of town. Unveiled in 2008 as a tribute to the King of Thailand, the clock tower comes alive every hour — as one would expect an ornate clock tower to do. But visitors who watch at 7 p.m., 8 p.m. and 9 p.m. get an unexpected treat. No spoilers here, but you’ll feel as though you just got sucked into Walt Disney World for a few minutes! Visiting tip: Don’t expect Chiang Rai to be a serene escape from Chiang Mai or you may be disappointed! The streets are perpetually clogged with drivers who think that sounding the horn will improve the situation. Although you’ll have to brave well over 1,000 twists, turns, and cutbacks on the six-hour drive from Chiang Mai, Mae Hong Son is definitely among the best places to go in Northern Thailand. The small town of 7,000 is about as close as you can get to Myanmar without getting into trouble. Shan cultural influences are apparent in the food and attitude. Many Burmese people call Mae Hong Son home. Remoteness is both a blessing and a curse; Mae Hong Son doesn’t often get included in itineraries for Northern Thailand. It’s usually relegated to being a stopover for travelers exploring the region by motorbike. The popular “Mae Hong Son Loop” is a scenic route popular with motorbikers that takes 4-5 days to complete. Mae Hong Son has all the enjoyable options of the other places to visit in Northern Thailand: temples, waterfalls, night markets, caves, and trekking to hill tribe villages. There are just enough hostels, guesthouses, and cafes, most of which are dotted around a small lake. The town is easily walkable. Located around 90 minutes north of Chiang Mai, Chiang Dao is the place to go for picturesque limestone cliffs and Thailand’s third-highest mountain, Doi Chiang Dao (7,135 feet). Although the mountain is barely a pebble when matched up against the massifs in Asia’s Himalayas, Chiang Dao is the premier place for bird watching in Thailand. Over 300 species, many of which are rare, can be spotted. The town is located very close to Pha Daeng National Park, an area popular for trekking through bamboo forests in a climate that isn’t as sweltering as the rest of Thailand. Karen hill tribe villages are nearby. Hiding among the other lesser-known places to visit in Northern Thailand, Lampang stays fairly low on the tourism radar. Perhaps it’s because Lampang is south of Chiang Mai (90 minutes) rather than north like Pai, Chiang Rai, and Mae Hong Son. But Lampang isn’t exactly a sleepy village. It’s the third largest town in Northern Thailand. Overnight buses and trains between Bangkok and Chiang Mai often stop in Lampang — it’s directly along the way. One thing that makes Lampang “different” is that there aren’t any sputtering tuk-tuks clogging the streets. Lampang is the last real place in Thailand where horse-drawn carriages are still a “thing,” but they’re on the decline. The fleet of songthaews (covered pickup trucks) circulating town is a more practical solution for getting around. The best time to visit Lampang is on Saturday or Sunday when the weekend market is thriving. Ceramics from the region are a popular item to purchase. The paper made from elephant dung makes a very unique gift for squeamish friends at home. Many tourists — Thai and Western — are drawn to Lampang by the only government-owned elephant camp in Thailand. The Thai Elephant Conservation Centre has been around since 1993 and is home to 50 or so elephants along with an elephant nursery/hospital. Note: Although the elephant center is government run, it is under criticism for forcing elephants to perform shows and give rides — practices stopped by many private centers. 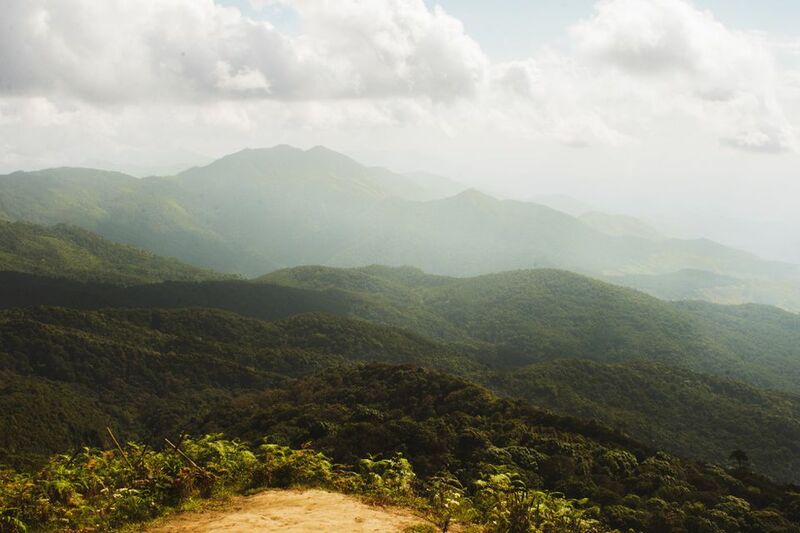 If Doi Chiang Dao wasn’t tall enough for you, you can trek to 8,415 feet on Thailand’s highest peak, Doi Inthanon. The weather will feel especially cool as you explore the temple near the summit and take in limestone scenery. Doi Inthanon is located around two hours west of Chiang Mai. The Thai National Observatory, a large astronomical telescope, is perched on top.